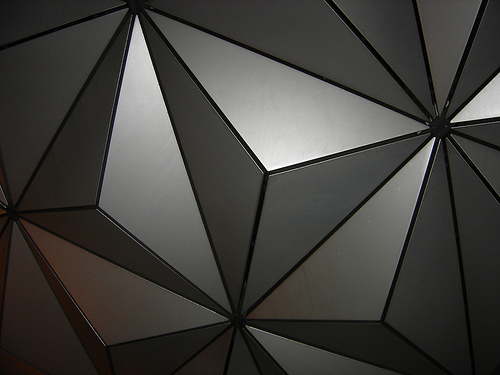 “Hey, that’s that golf ball thing!” is a phrase I hear a lot when people see my desktop background of Spaceship Earth. Instead of giving more information about what that person is looking at, I usually just smile and say, “Yep, that’s that golf ball thing.” But Disney Nerds will agree that it’s much more than that. 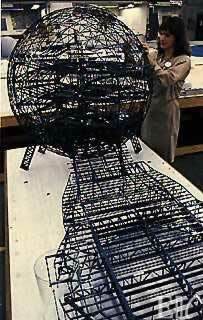 It took countless hours to design Spaceship Earth (SE) and a full 26 months to build it. This article is dedicated to the design and construction of both the structure itself and the attraction housed within. 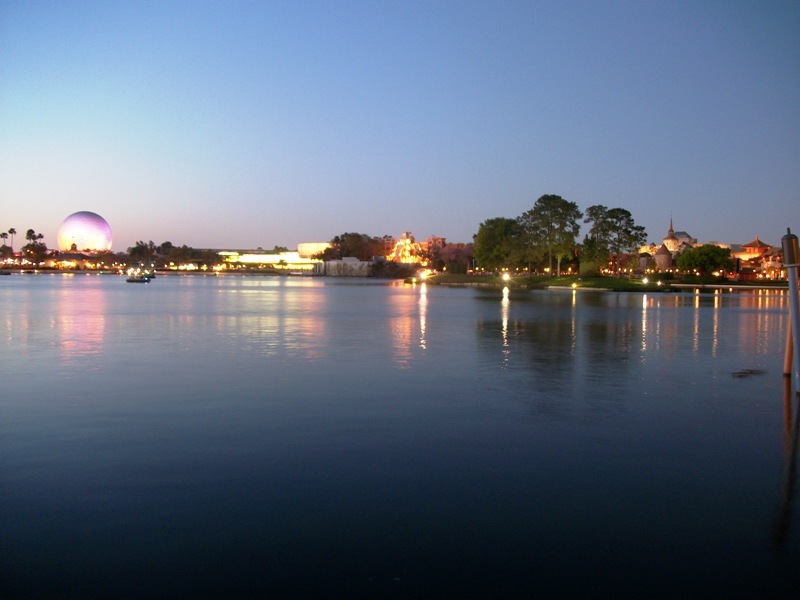 After the success of Magic Kingdom Park in Walt Disney World, Disney Imagineers decided to use portions of Walt Disney’s idea for the Experimental Prototype Community of Tomorrow (EPCOT) to develop a new theme park that would be called EPCOT Center. Today it’s simply known as Epcot. Just like Magic Kingdom’s Cinderella Castle, WED Enterprises wanted Epcot to have a central icon to embody the theme of the park and to draw guests in. They wanted a “logo” or focal point of the park, and they wanted it to be in place for Epcot’s grand opening on October 1, 1982. 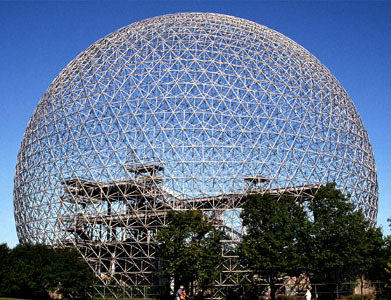 The designers at WED expressed interest in the design of the Expo ’67 dome in Montreal. 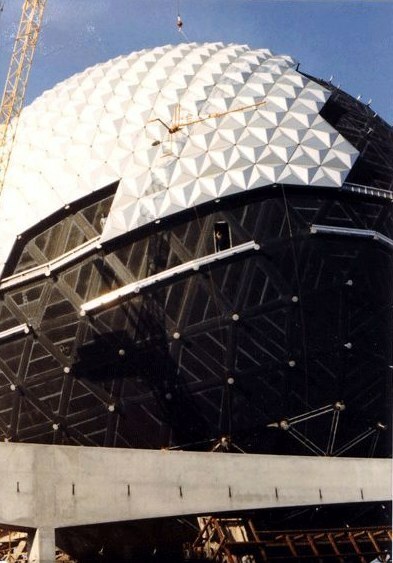 They liked the geodesic design and decided they wanted Spaceship Earth to have a comparable look. WED’s project designer for SE was a man named Gordon Hoopes. He said that his intention was to “create an atmosphere for our guests that raises their spirit and kindles an excitement for the human experience in the future.” WED played with the idea of a dome but soon decided they wanted a full sphere. They settled on the size of a 160-ft. diameter geodesic sphere elevated above the ground. The title of the icon was not developed by WED alone. The term was popularized by Buckminster Fuller in his 1968 book Operating Manual for Spaceship Earth. 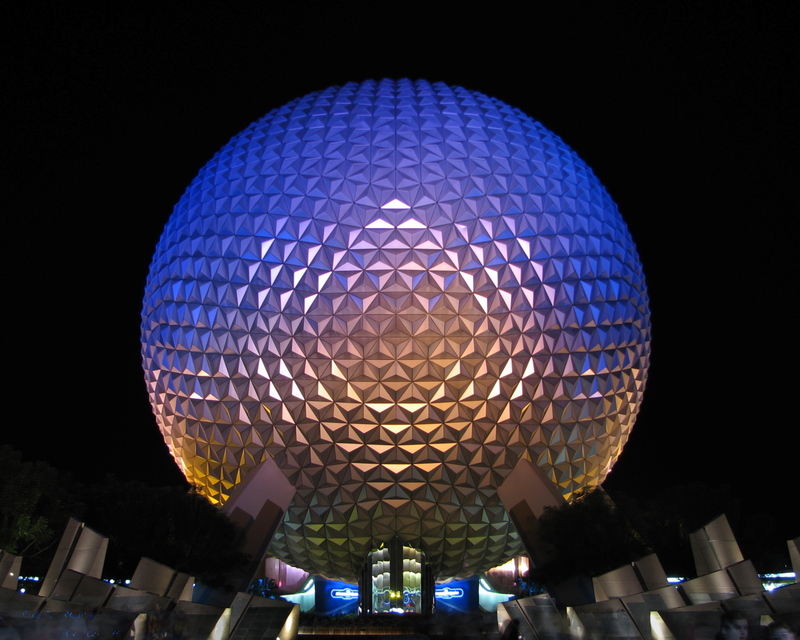 Epcot’s Spaceship Earth is not simply an architectural icon; it also houses an attraction of the same name. WED enlisted the help of several third-party entities to collaborate on the concept and development of the attraction. Along with Buckminster Fuller, Disney Imagineers worked with science fiction writer, Ray Bradbury on its structure and storyline. They also consulted with Los Angeles’ Huntington Library, the University of Southern California, the University of Chicago, and the Smithsonian Institute. Because a geodesic sphere (as opposed to a dome) was a novel concept and there was little engineering data on this type of structure, WED also hired MIT to conduct wind tunnel studies on a 1/16” = 1’ scale model. They did this to determine pressure coefficients for the design and to test wind pressure underneath the sphere – where the guests would be walking. They didn’t want the wind to knock guests down as they passed under the structure. Essentially, SE is two separate structures: the external shell which is the sphere itself and the internal ride system and show scenes. From now on in this article, I’ll refer to them as either the Shell or the Show. Besides being a full sphere, SE was unique in another way. 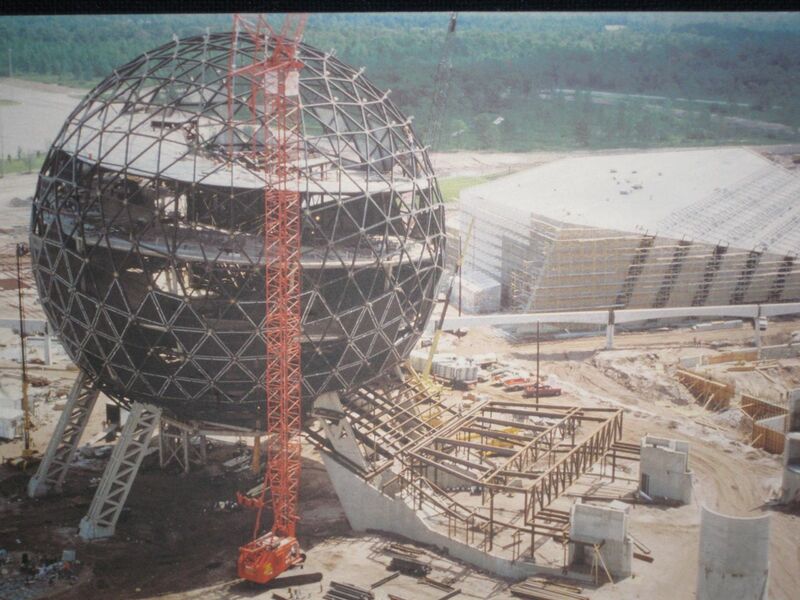 WED wanted to put an attraction with moving vehicles inside the sphere, and they wanted SE to be elevated above the ground on six legs. Their first concern was how they would carry the load of the Shell. If they allowed the six legs to bear the full load alone, it would put too much stress on those individual sections of the sphere. This could cause the Shell to buckle in the areas of concentrated force; they needed to distribute the weight more evenly. They decided they would keep the Shell structure completely independent of the legs. First, they drove the six legs supported on pile groups between 100’ and 160’ into the ground. They connected the top of each leg with trusses to form a hexagonal truss and reinforced it with additional interior trusses which formed a platform. At this point, SE looked sort of like a six-legged table. The hexagonal trusses, or the perimeter of this “table”, are what carry the load of the Shell structure. This table including the interior trusses also bears the load for the Show structure. Because this platform was so crucial, they needed to apply some dead load to the hexagonal trusses before erecting the Shell. 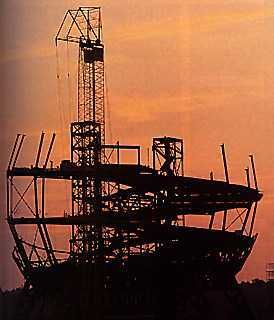 They were able to build the majority of the Show structure before beginning construction of the Shell. They erected the interior columns and most of the ride helix onto the platform. This ended up working well for WED because the construction of the Show and the Shell could occur together. I should also mention that there is an elevator shaft that runs vertically through SE that is not associated with the hexagonal trusses. The base of the truss that forms the shaft is covered by mirrored panels that you can see as you pass underneath SE. Once most of the Show structure was completed, they had to begin transitioning from the hexagonal trusses to the Shell. They used what they called “quadrupods” which are shaped like pyramids formed from pipe. The bases of the quadrupods were connected to the outer perimeter of the hexagonal trusses and the tops of the quadrupods were connected through support hubs on the Shell to make an interlocking ring of sphere struts. Then they were ready to build the Shell. The Shell is basically two geodesic domes – one on top of the other. The top ¾ of the sphere rests on the table and the bottom ¼ is suspended below the table. The geodesic dome maintains its shape simply by the nature of its design. It does not require reinforcement. The larger the dome, the stronger it is. When SE was built, the construction of the Shell first traveled upward from the support hub level in rings of struts until the entire top portion was complete. Then the remaining portion of the sphere was completed below the support hub level. Construction then continued to complete the exterior of the Shell. The Shell structure is actually a sphere-within-a-sphere – the larger (exterior) sphere has a radius about two feet greater than the smaller (interior) sphere. The “double-skin” came about as a solution to a few problems WED had explored during the design. They needed a waterproof and fire-resistive exterior to protect the occupants, sets, and attraction vehicles. And most importantly, it had to look good. There was no one material that could accomplish it all, so the sphere-within-a-sphere concept was born. Steel closure panels with a waterproofing neoprene sheet were attached to form the inner skin. The outer skin would be purely for show. They needed an aesthetically pleasing material that could withstand the elements of central Florida. They chose a material called Alucobond which is polyethylene plastic sandwiched between two sheets of aluminum. They used aluminum pipe standoffs to create the gap between the inner and outer skins and attached the Alucobond facets to them. The inner shell’s basic structure is an array of large triangles. 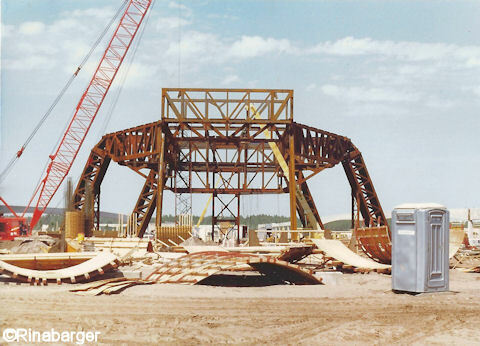 For the outer shell, John Hench (WED VP for Creative Development) decided to subdivide each of the large triangles into four smaller triangles on which they placed triangular pyramids. What we as guests see are the small triangular pyramids. The sphere-within-a-sphere design also addressed another issue: runoff of rainwater underneath SE. 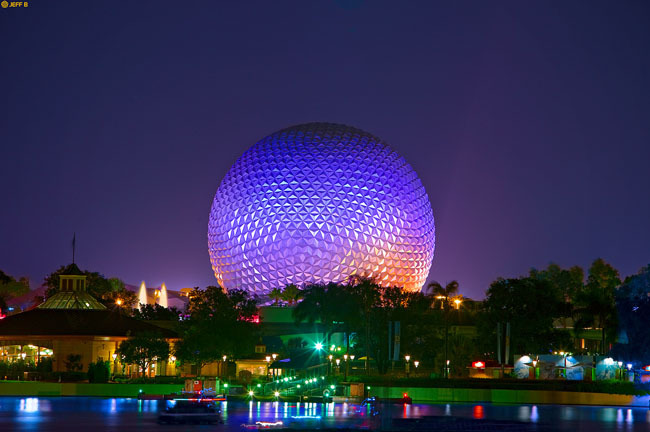 By leaving one inch gaps between the Alucobond facets, rainwater trickles down to the waterproof inner skin where it accumulates at a hidden gutter system near the “equator” of the sphere and is then carried out to the World Showcase Lagoon. Spaceship Earth, the attraction, takes guests on a journey through time highlighting the ways in which humans communicate. The ride structure is arranged in two helixes that serve as the track for the ride vehicles. The vehicles spiral up to the top of the sphere and back down to the unload area. Along this slow-moving journey up into the sphere, guests encounter various props, projections, and Audio-Animatronics. If you want to know more about how Audio-Animatronics work, you can check out my post about AA’s. 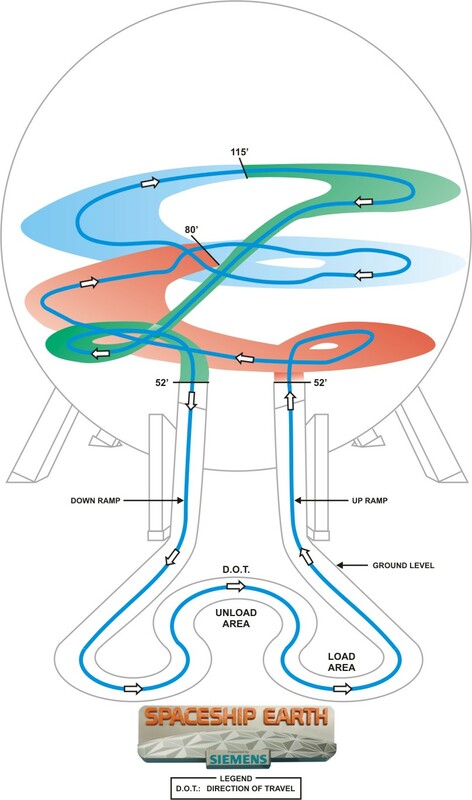 The ride vehicle utilized on Spaceship Earth is Disney’s Omnimover system. Imagineer Bob Gurr combined two terms already in use, OmniRange and PeopleMover, to create the term Omnimover. The true root of the term Omnimover comes from the Latin term “omni” meaning “all” or “every” and “mover” meaning… well, “mover”. The technology itself was developed and patented at WED Enterprises by Roger Broggie and Bert Brundage in 1968. Each vehicle is capable of rotating or tilting to a preprogrammed position. This system is advantageous for Disney in that they are able to control what scenes guests will view in order to tell a story while obstructing portions of the attraction that are meant to remain hidden. SE’s ride system also includes speakers on each individual ride vehicle. Disney can cue a portion of the soundtrack/narration at predetermined locations along the track. This gives each guest the same ride experience. Then, the 2007 renovation of SE added interactive displays to each vehicle. Every time I see Spaceship Earth in photos or when I visit Epcot, I have a huge appreciation for the complexity of the structure itself, the attraction, and the story behind its design. So next time you hear someone say “Hey, that’s that golf ball thing!”, you can direct them to this article to help them understand why we Disney Nerds think it’s much cooler than a golf ball. If you have anything you wish to add, please feel free to comment below. I am not affiliated with the Walt Disney Company. All thoughts and opinions are my own. I think Epcot is an amazing design. Now how could we put it into space? Mallory, you truly are the best!!! Thank you sooooo much for the fantastic info! Thank you so much for reading! I’m glad you enjoyed the post. What an excellent explanation! I was involved in the project architecturally as a Disney employee, and you got everything right except that the folks at Disney don’t know everything, and we used expert consultants. Simpson Gumpertz & Heger solved the structural problems that you describe so well, and they get very little credit. I was involved in the decision to use Alucobond, but the Disney Project Engineer, Doug Stapp, wouldn’t consider it without exposing the material to a simulated lightning strike. Thanks very much for reading! And thank you for sharing! It’s very neat that you were involved in the decision to use Alucobond. I would have loved to see a simulated lighting strike test. Now you have me very interested in Simpson Gumpertz & Heger; they certainly have not received the amount of credit they deserve. Thanks again for the information! How many pyramids were used in the outside casing. Also, what were their volumes? Hi Komu, I wish I had that information for you, but unfortunately I do not. Some of the resources I’ve cited may have dimensions of the alucobond pyramids for you to calculate their volume. Hope that helps, and thank you for your comment. Thank you so much for the detailed explanation. I find the photos of its construction striking in the detail exposed and the emptiness surrounding the site. We just returned from our second family trip to WDW, and each time, SE was by far my favorite attraction. Thanks for the kind words, James! I’m so glad you enjoyed your family trip. Wow! That’s so neat. I’d love to see some of those photos. Excellent info about the gutter system. The gutter system isn’t about efficiency, it’s about not having guests walk under a circular waterfall during rainstorms. Also, I think you mean dedication, not dereliction–auto-correct strikes again, perhaps. It is an exact circular globe in the same way a many-sided polygon inscribed in a circle is an exact circle. Because it is composed of straight lines, it only approximates a sphere, but because there are so many lines, it’s a close approximation. Fantastic explanation. I really appreciate you sharing your knowledge of this project. Fascinating! Nice article, just what I was looking for (track path). Thanks. Hi my friend and I are doing a project about the science and engineering in Disney World and we were wondering if you knew anything about it or if you know anyone who does? Hi Lydia! You can find several books, television specials, and web content regarding that topic. A quick search should give you a lot to choose from; my site is simply a fan site! Alcubond is the highly flammable cladding material that led to the death of around 80 people at Grenfell Tower in London in June 2017. No word from Disney on Spaceship Earth being a fire risk? Hi Paul! This article might interest you. https://www.alucobondusa.com/blog/the-critical-importance-of-aluminum-composite-fire-performance-on-high-rise-buildings/#.Wf8RtmhOmaM. Alucobond made the statement that their company did not provide the cladding for the Grenfell Tower (I believe Reynobond was used on that project – another manufacturer of ACM/ACP). As for an official response from Disney regarding the cladding on SSE, I have not personally come across anything. Please share if you do!